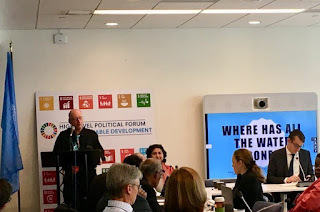 This is a blog based on a presentation I made for the UNDESA workshop: Advancing the 2030 Agenda: Inter-linkages and Common Themes at the HLPF 2018. My power point can be downloaded here. The Nexus in its present discussion started when the German government initiated the discussions in August 2010 held at the Stockholm Water Week. They had successfully hosted conference in 2001 on Water and 2005 on Energy and they were now looking to input to the Rio+20 Conference. The 2011 Bonn Nexus Conference was a real attempt to address the inter-linkage agenda of Water-Energy and Food (WEF) . The inter-linkage agenda isn’t a new agenda there was always a paper at the old Commission Sustainable Development but rarely was it taken seriously – or perhaps we just thought we had more time. The Sustainable Development Goals (SDGs) have changed that and one of the key differences we all recognize is that we live in a more complex world and that the goals and targets in the SDGs are a first really attempt to address that complexity. For the 2011 Bonn Conference the material produced for the International Advisory Board by the Stockholm Environment Institute still holds true. They suggested that the drivers we needed to address were population growth the increased urbanization, economic growth particularly as identified in India and China. The 2014 and 2018 Chapel Hill Nexus conference in 2014 and 2018 added climate change to this list. The critical impacts are that by 2030 there will be an estimated 40% increase in demand for energy and a 30-50% increase in the demand for food BUT for me the critical issue is the gap of water resources between availability and demand estimated at 40%. These figures were prior to the agreement on the SDGs and their targets and indicators. But it’s fair to say although there is enormous enthusiasm and activities to implement the SDGs we are already falling short. In last year’s global scan survey of over 500 experienced sustainability professionals only 8% through that there had been good progress on the water goal, 7% of the food goal, 9% on climate change goal and 11% on the energy goal. I share that because it has an impact on advancing the SDGs. David Leblanc’s chapter in the Water-Food-Energy-Climate Change book that Jamie Bartram and myself edited two years showed it shows the linkage between water-food-energy and climate change. I would draw your attention to the two smaller black dots that I believe are critical to being able to address the other elements here. We need to build resilience and adaptive capacity which is the theme of ECOSOC and the HLPF this year and we need to create Nexus National policies, strategies and planning that encompasses this complexity. I would amend this to say all levels of government. It’s not new but we need to create ‘more with less’ the World Business Council for Sustainable; Development around Rio+5 in 1997 argued that what was needed was an efficiency gain of factor 4 and factor a 90% decrease in resource use. By Rio+10 this had become a factor 20 increase in eco efficiency. What this means is we need to reduce and reuse water wherever we can, we need to reduce wastage of food, part of this is also about being able to in some countries get food to market so it’s an infrastructure issue. And on energy. 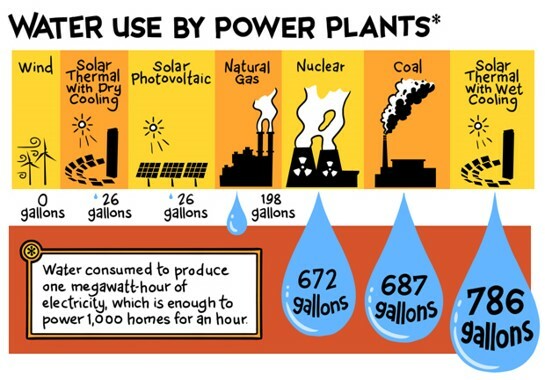 As you can see fossil fuel extraction uses huge amounts of water compared to wind and solar. Energy supply at this moment accounts for nearly 15% of the global freshwater extraction. I would add that 30% of the worlds energy consumption is through the agri-food supply and agriculture represents 70% of freshwater use so there is some compelling evidence for all of us to look at interlinked solutions. A move towards renewables not only helps address climate change but also saves water. Policy coherence is critical to addressing the Nexus. This needs to be at all levels of government – it will require horizontal, vertical and enhanced governance models to be created. Horizontally, sector ministries need to work together at a level we haven’t seen before. Vertically national relationships need to be strengthened with sub national and local governments and enhanced stakeholder engagement is needed at all levels to ensure all voices are hear. There will need to be tradeoffs among water, energy and food in the design of any implementation plan and investment and that will only be successful if all stakeholders are engaged and their voices heard. The role of sub-national and local government is where the rubber meets the road as they say. This is the level of government where the trade-offs become critical, where the citizens are impacted by the decisions and where effective spatial linkages can be taken into account. There needs to be the development of more toolkits to enable these levels of governments to really start to address these issues. The push to have all companies listed on Stock Exchanges to report and explain their environmental impact, governance and social policies and practices would go a long way to accelerate companies to adopting a Nexus approach. Two reports in 2011 and 2013 by high level, expert panels to the UN Secretary General suggested that this should be done. The Secretary General’s Sustainable Finance Summit in September should advance this and Nigeria has been sharing a possible GA resolution that addresses this and other issues. Adopting a reporting process, companies can use the Nexus to ensure a more sustainable future not only for their company but for all of us. To create optimal solutions, it is necessary to better understand the interlinkages of company strategies, investment and behaviors. The 2018 Nexus Conference will take forward this agenda through reviewing the following agenda. Hello Sir, You are soo amazing and inspirational to me as a youth advocate from Ghana. Your articles keep me moving on my advocacy journey. can you send me email on ametepey.francis@yahoo.com for further engagement?